Wondering who’s at the marsh? Well, the marsh is home to many animals and is visited by many others. There are birds, reptiles, mammals, and more. The marsh is a very complex community of animals, plants, and flowing water. Animals such as beaver make their home there, while coyote go to the marsh in search of food. Waterfowl nest in the marsh. So, this is a fun place to explore! One year round resident you can readily spot is the muskrat. Look for the mounds of reeds that are their lodges. And since they usually stay within 150' of their lodge to feed, just be patient, and quiet, and you can watch these interesting animals as they travel about. Muskrat can weigh up to 4 lbs. And a really large one could be as large as 25" from tip of nose to tip of tail. Their back feet are webbed, so they are excellent swimmers. And much of what they eat is in the water: mostly aquatic plants, but also snails, shellfish, frogs, and salamanders. A muskrat living out in a marsh is not a pest, but rather a valuable member of the marsh community. By harvesting reeds for their lodges, they open waterways for ducks, and other birds and animals. And the muskrat lodges are used by other animals as nesting and resting sites. While the muskrat live beneath the mound, the tops are used by snakes, turtles, geese, and ducks. To spot a lodge, just look for mounds of reeds. They build their lodges in water that is 2-4' deep. And in winter, when the ice is safe, you can tell which mound the muskrat are in by spotting their toilet area! That’s right, they select an area to use for their toilet (so do beaver), and their droppings will be concentrated there. In winter, muskrat move in together for added warmth. A mother and her surviving young, and an adult male or two, will all share the lodge. But come spring, they go their separate ways. In spring the female will give birth to a litter of about six babies, called kits. She’ll have as many as three litters a year! 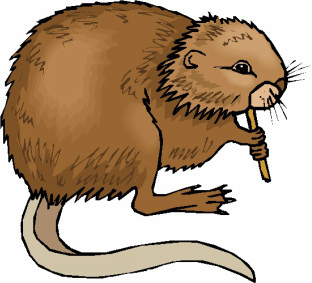 But most muskrat do not live longer than one year. Life in the marsh is not easy. Many other animals feed on the muskrat, including coyote, foxes, large hawks and owls, and even large fish will eat a young muskrat. House cats and dogs also kill muskrat. But be careful! These cute and compact animals are not to be approached - they are fierce fighters when threatened. Just watch them from a distance - and enjoy! To identify their tracks in the snow or soft soil, see the animal track identification sheet below. Print out the one page guide, follow the cutting instructions, fold in half and put it into a plastic bag - and now you have a field guide for identifying animal tracks! You can see that the muskrat’s back feet are webbed for swimming. To see how to identify who’s been chewing the bark, click on this link www.fs.usda.gov/Internet/FSE_DOCUMENTS/stelprdb5353715.pdf for photos that tell you what to look for. A quick hint: how high the chewing is says something about the height of the animal or its ability to climb.